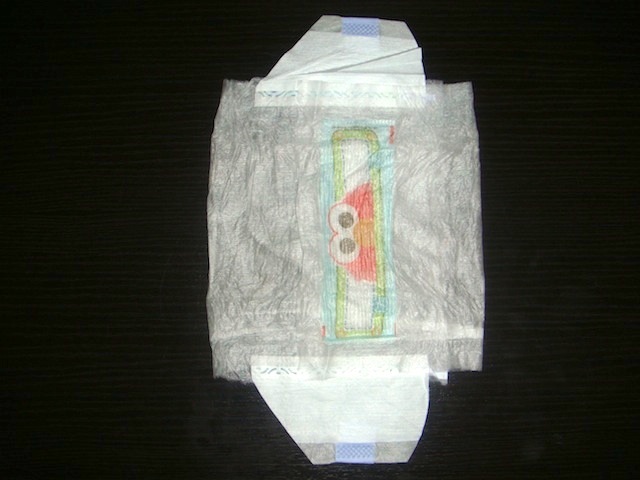 Extending the tapes on baby diapers is an age-old mod that many people here have discovered independently. Any number of methods for doing this have been posted on ADISC, and while I don't do it often myself, I have found the following method to work quite nicely. 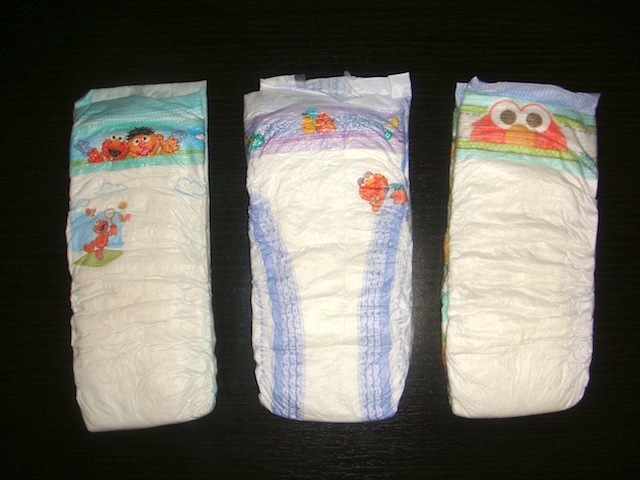 What's more, the end result is reusable, and the process is relatively tidy, as it does not involve cutting into diaper cores and scattering SAP beads everywhere. Locate your "victim" diaper. 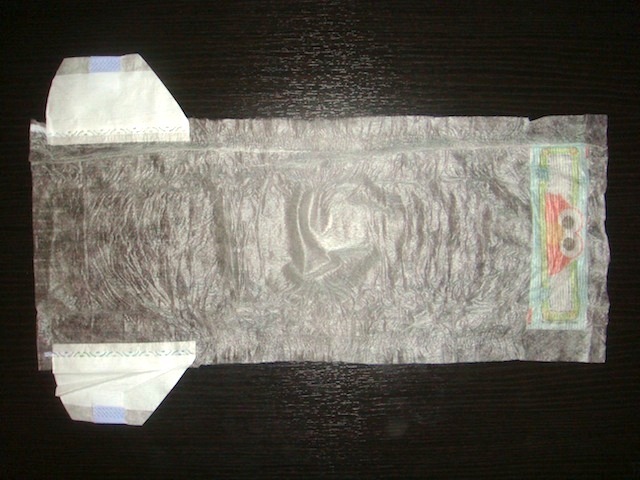 This should be a Pampers Baby Dry, Extra Protection, or Cruisers (a.k.a. Active Fit in the UK, maybe elsewhere). 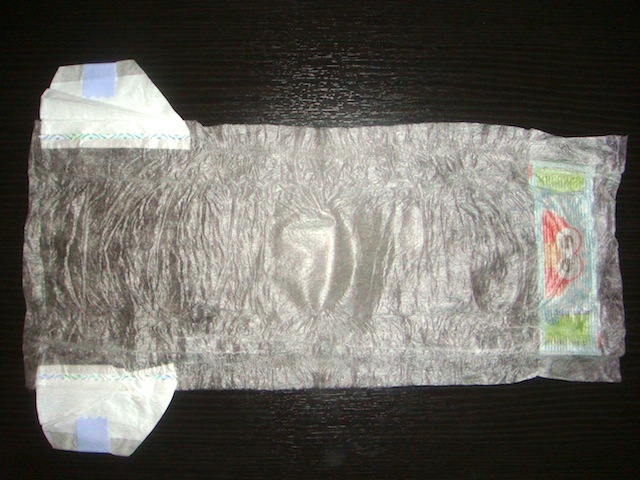 Remove the entire cloth-like cover of the diaper. 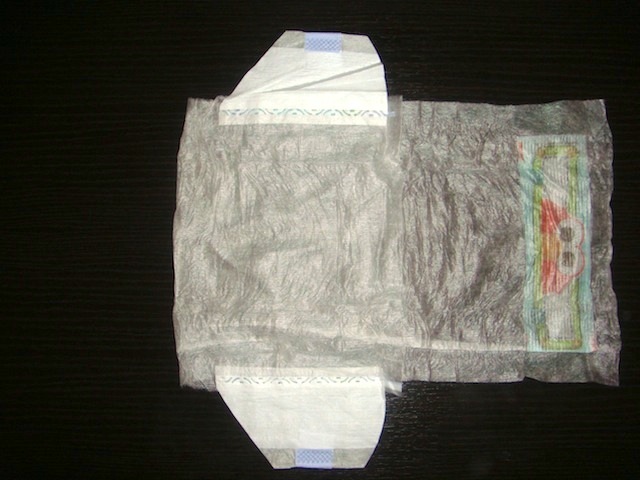 Ordinarily, when removing the cover of a Pampers diaper, one needs to be concerned about leaving the tapes and the landing zone attached to the diaper. Not this time; you want it all! Lay the cover so that the landing zone is face-down, and the ends of the tapes are face-up. Fold the tape end of the cover inwards. The exact location of the fold is not important. Fold the landing zone end of the cover in so that the landing zone is aligned with the tapes. 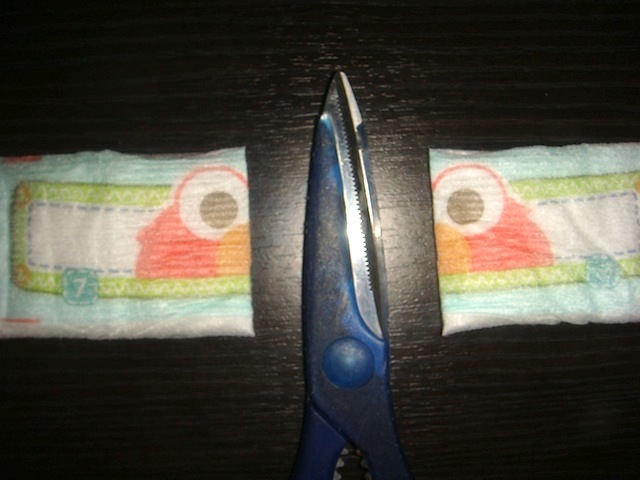 Fold the extra material under so that only the landing zone and tapes are visible. Place some staples just inside of where the tapes connect to the cover at each end. NOTE: I recommend stapling from the back, behind the landing zone (as seen below), so that the pointy sides of the staples won't be against your skin. Staple the loose ends of each extender so that nothing unravels. So there you go. 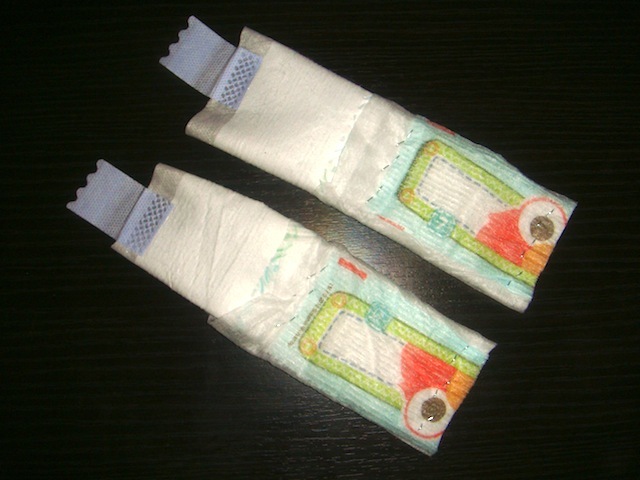 Two nice, reusable tape extenders for your baby diapers. They're soft and fluffy, too! And one final twist: I actually find it easier to use these as *landing zone* extenders. 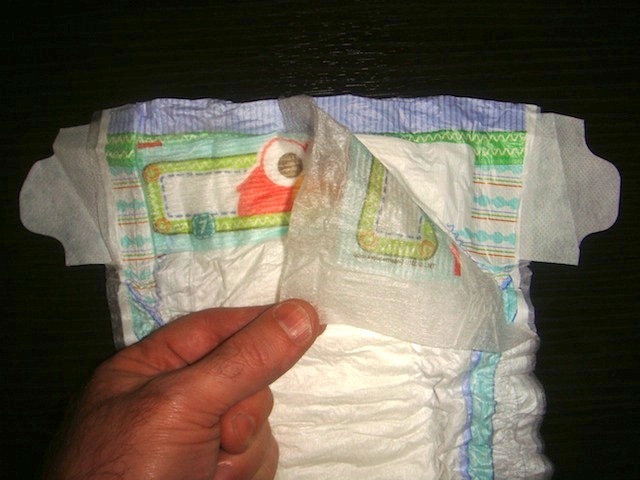 That is, apply them first to the landing zone on the front of the diaper you want to put on. 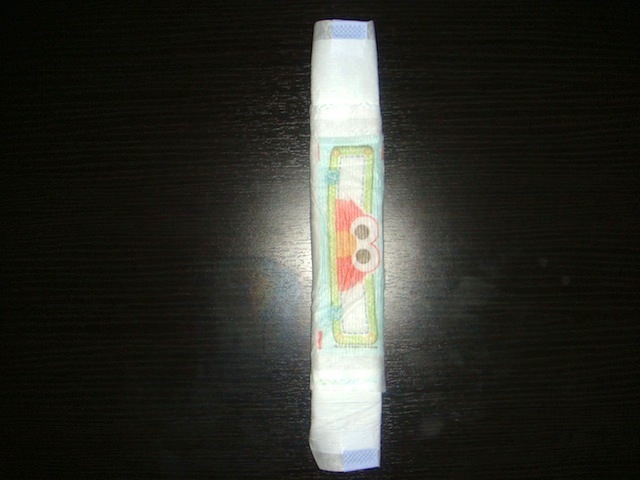 Bring the front of the diaper up between your legs, then fasten the tapes to the extenders to complete the process. 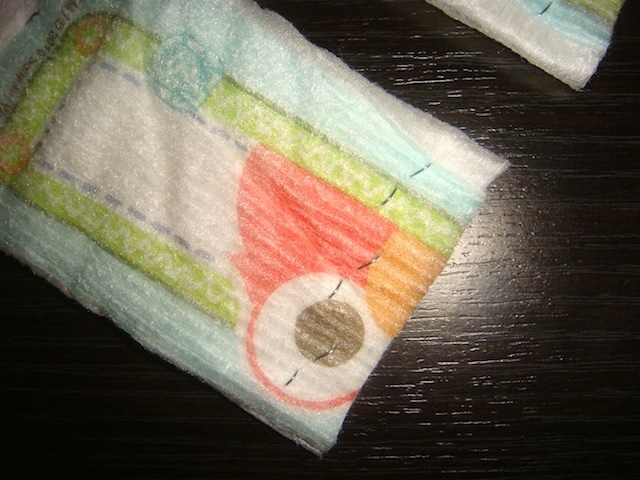 By doing it this way, the extenders can be taped to the outer edge of the landing zone on the diaper you're going to wear, and this will better support the whole front of the diaper, which should help avoid gaps. However, you should experiment and see what works best for you. Impressive! You are a lot more patient than I am. I tried it but it didn't seem to be going right, so I quit before I ever got the cover removed. It looked as if I was about to have a serious mess, so I gave up. 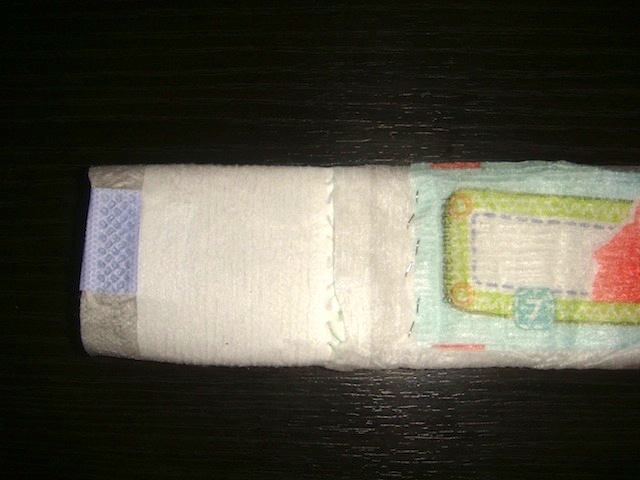 It would be handy though, if anyone wants to use a baby diaper and nothing else. This is great. Works so well! Thanks for sharing. Although usually prefer adult diapers. I just bought baby diapers as fillers, but gotta try this out!! very interesting, I shall try this when I next have the opportunity.